Brady Lindauer’s personal and team goals with the North American 3 Hockey League’s Coulee Region Chill meshed perfectly early this season. “You shoot your goals high and you want to put up points,” Lindauer said, “but right away, we were just trying to get in the win column. Both totals kept rising and did not stop. “They came hand-in-hand with each other, which is nice,” Lindauer said. The Chill went 36-9-1-1 to win the Central Division for its first regular-season championship in the NA3HL. Lindauer won his own title as the league’s individual scoring champion. Already an effective scorer, his production took off, beginning with a seven-goal game in the next outing after the Chill walked off the ice following a Dec. 8 loss with a 10-7-1-0 record. Coulee Region went 26-2-0-1 the rest of the way. After averaging a goal and 1.29 assists per game in the team’s modest start, Lindauer put up 1.45 goals and 1.83 assists per game the rest of the way to finish with 59 goals and 75 assists in 46 games. Linemates Thomas Magnavite and Brandon Ratzloff joined Lindauer, a 19-year-old from Cary, Illinois, among the NA3HL’s top 14 scorers. “We have some pretty good chemistry between the three of us and coach pretty much kept us together,” Lindauer said. Magnavite, a teammate for the last three years, beginning with their youth season together with the Chicago Mission, will be with Lindauer again next season at Division III St. Mary’s University of Minnesota. He was fifth in the league in points with 54 goals and 54 assists. 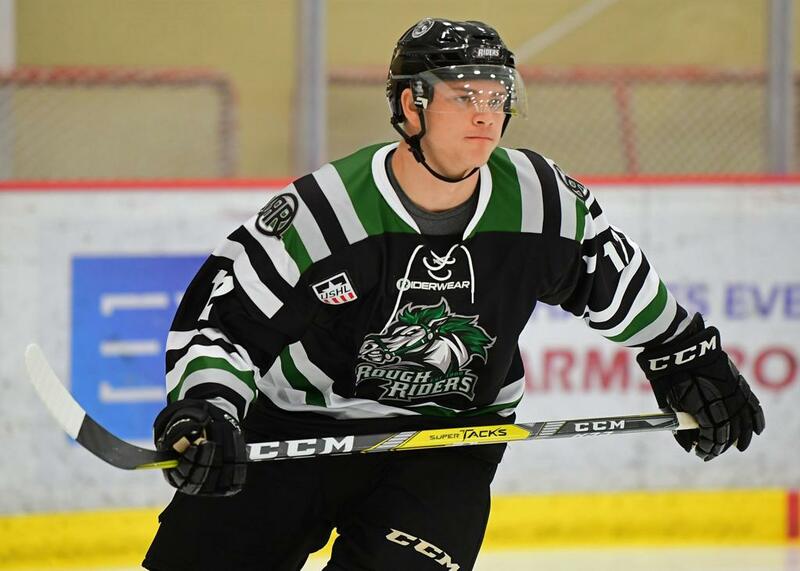 The early-season commitment to St. Mary’s, shortly after putting aside other pursuits and returning to the NA3HL in time for the start of the season, made the recently completed season much different for Lindauer than 2017-18. A year ago, he was up in the NAHL twice and trying to move up in the junior ranks. Content with his future plans and giving off the clear impression that he was not trying to get elsewhere, Lindauer was able to concentrate on a successful season at and for Coulee Region. “I think my mindset between the two years was very different,” he said. “Last year, I was playing like I had something to prove after I was sent down. That almost puts a level of stress on you. And, worry about refining his skills under coach Bill Moore. “Our coach is very good at keeping players after practice,” Lindauer said. “I think that showed a lot in the stats, but also in some things that wouldn’t show up on the stat sheet. Lindauer has watched St. Mary’s plan and said he knows he needs to get bigger and faster and be ready to finish his checks more consistently as he enters college.